The Istrebitel' Tankov 1 (Tank Fighter 1) was a concept in the early 1960s to test the feasibility of replacing the unguided tank gun with the guided missile at a time where the same evolution was happening in tactical aviation. The tank was based upon the T-62 main battle tank with a new turret housing the missile launch system. The missile was purpose-built for this application and designated 3M7 Drakon. The IT-1 carried 12 Drakon missiles internally and were automatically loaded through a hatch atop the turret. The operator inside the tank guided the missile using a joystick system similar to the 9K11 Malyutka (AT-3 Sagger) though the Drakon was radio guided whereas the 9K11 was wire-guided. While the concept looked good on paper, in practice the system was not popular. While the IT-1 did enter limited production, the tank was found to be impractical as it couldn't attack close-up targets due to the flight time needed to arm the missile (safety feature). With only 12 rounds available, it had to withdraw frequently to reload. Eventually the IT-1s were converted to armored recovery vehicles. Trumpeter continues to produce some of the more exotic (rare) combat vehicles and this release is no exception. 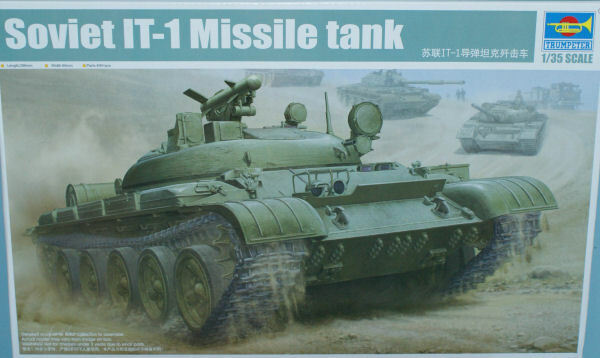 The IT-1 version of the T-62 is nicely developed from the stock T-62 kit with new-tooled parts provided to render the unique aspects of this missile tank. The kit is molded in light gray styrene and presented on 15 parts trees plus four trees of black parts and one small fret of photo-etched parts. Seven of the 15 gray parts trees consist of the individual track links. One unique aspect of this kit's design (and that of the T-62 as well) is the road wheel layout. The 'hub' of he road wheel is molded in light gray and the rubber tire is the black ring (plastic, not vinyl) that slips over the wheel. This makes painting significantly easier! The most time-consuming part of the build will be the assembly of the individual track links, but if you have a good jig, this can go together rather quickly as well. The fenders are molded separately from the hull and this kit boxes in the hull nicely (no air gaps to fill as with earlier T-62 kits) nor are there any holes to fill in the lower hull. The exterior of this kit is very nicely detailed with all of the standard T-62 stowage plus the unique additions of the IT-1. Even the snorkel has been relocated from the rear of the turret to the engine deck, nicely done. While there is no interior to this kit (it would have been interesting to see the twelve-round autoloader represented), the cost of such detail would have put the MSRP of this kit way out of practical reach. This kit will make a nice addition to your Soviet/Warsaw Pact armor collection and will definitely look unique on the contest table amongst the Tigers and Shermans. My sincere thanks to Stevens International and Squadron Mail Order for these review samples!